We're huge NPR listeners here and I think you'll love it. I think these dishes look great; the only thing I'd do differently is to use chicken sausage because that's what we prefer but they both look easy and good to me. I love sausage. I know it is not the most healthy food out there, but like you said if you are trying to make food budget go a little further a sausage meal is a good bet. 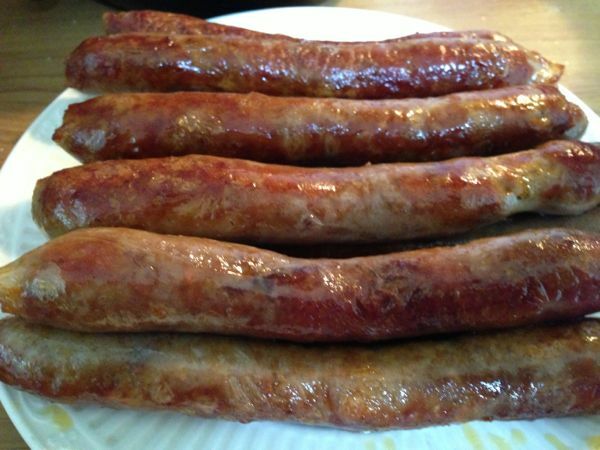 Several ways I cook a sausage meal are simple. We love a barbeque meal. 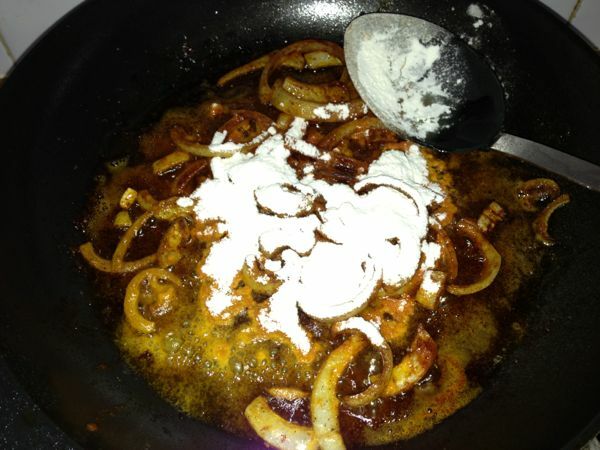 I take pound of sausage, cut it into serving size pieces, chop an onion, and about a cup of barbeque sauce. Cook in oven covered about 40 min. Another way we love it is in what my family calls sausage hash. With sausage cut into bite size pieces, onions, green and red bell peppers and small red "new" potatoes are cooked on top the stove in a frying pan. 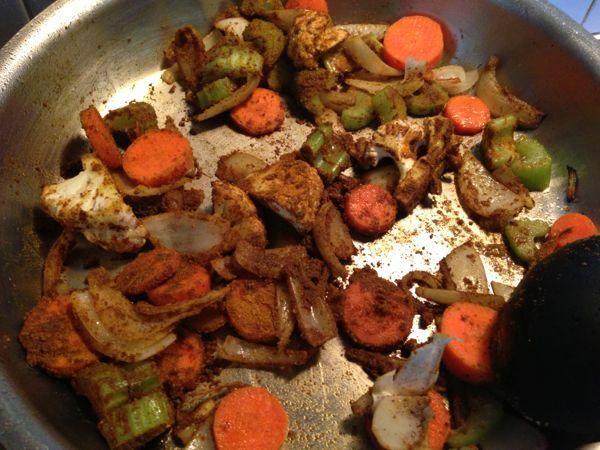 (I precook the potatoes before I cut them into bite size pieces to add to the pan of sausage and veggies) I serve with eggs and toast. Sausage and bell peppers served on buns is another wonderful meal. Simple, but wholesome foods are such a delight. My children often had a similar version of your meal. Instead of making a curry sauce I often made a tomato sauce with 2 fresh tomatoes and a little ketchup, then simmered the sausages in that. 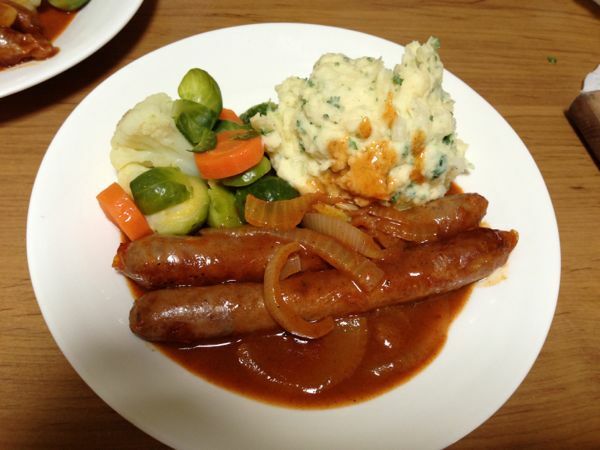 We also had the sausages placed into a pan cake batter, baked in the oven, served with some cabage and gravy on the side. You can even make a mock stir-fry with sausages added at the end. So many varieties can be made up with the humble sausage. Both recipes sound delicious to me! 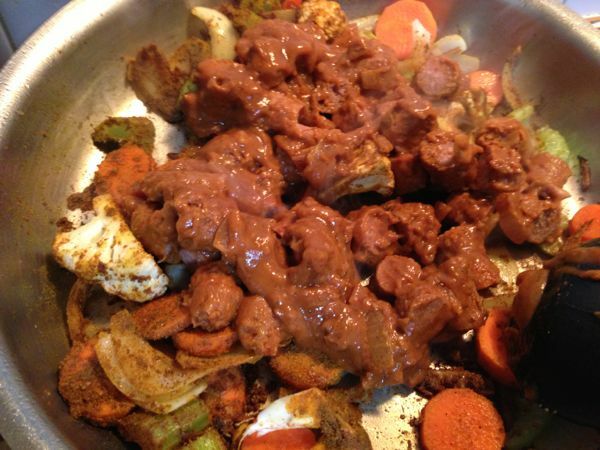 The first recipe with onion gravy brings back memories of when I was a young mother and was using Delia Smith's "Frugal Food" recipe book. It must have been one of her first books but it's still available. She had a chapter about offal, another about mince, and the one about sausages of course. All good hearty stuff for a growing family. And delicious too. I was catching up with your blog on the way home from 6 weeks away yesterday and I just wanted to add my radio recommendation as I live on the SC too. I live 612 ABC Brisbane and my favorite session is Conversation hour with Richard Fidler. Richard interviews mostly people who have done extraordinary things or had extraordinary things happen in their lives. I just love listening to these stories as I go about whatever I am doing You can also download the podcasts and Richard even published a book of some of the stories though I love to hear the voices behind the stories. I think you'd love these stories Rhonda. Also the lemonade I'd like to make the syrup with just lemon juice and sugar and freeze it and then just add a bit to carbonated water as we want it as we have a soda stream. In my travels I have tried both basil and thyme lemonade and that is lovely too. I didn't think I had too much utter until I got home. Oh yes I do!!! Thankyou for a reminder of these wonderful old style recipes. Would also taste good made with vegetarian sausages. The strawberries are a wonderful blessing at the moment here , I blend them with other fruit for a delicious breakfast or snack. I have just started reading your Down to Earth book again ,after I finally retrieved it from one of my daughter's. It's really good to read again & a source of inspiration for me as I go into my final week of radiotherapy for Breast Cancer. Your blog ever day keeps me connected early in the morning. Many Thanks Rhonda you are a inspiration. Nothing wrong with 'bangers and mash' in fact at the request of my son that is exactly what we are having for dinner tonight! I too am re reading your book, I picked up at my daughters place whilst staying with her in Seattle US. I found it far more interesting than the current book I bought with me to read. A friend from Brisbane (AUST) bought it over for her and am enjoying it and able to read your blogs in the afternoon here. At present we are travelling in Canada and today we saw a black bear cross the road in front of us. From a girl from Brisbane that is pretty exciting and earlier in the week we saw a Mum and her cub cross the road. I know it is off topic but I just had to tell someone. I'm pleased you told me about the bears. I have always thought that bears roam all over north america and although I'm assured by my north american friends, that it's not the case, you've just confirmed it for me. Enjoy your holiday! 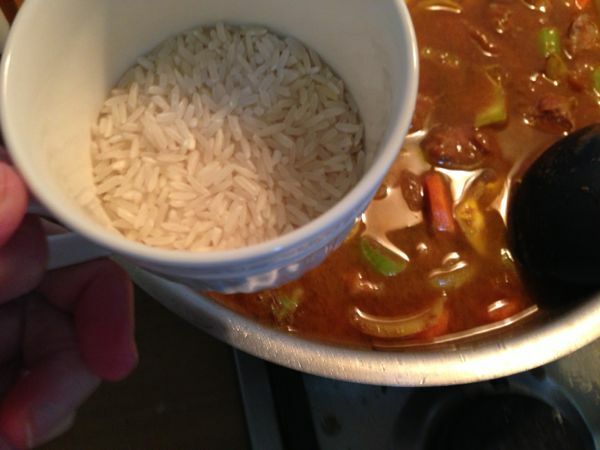 Oh yes, that is an old memory from when the kids were growing up, just make the curry mild and add some sultanas (and sometimes chopped apple) and the kids will eat it with sausages, chicken or prawns, if you can catch them. I also remember an old recipe with savoury mince that included chopped cabbage and rice, it made a little mince go a long way. very good. I love onion gravy, but would you not need a bit more than one onion to a quart of water? I have been sneakily adding the tiniest bit of chilli powder, just enough to give a warm edge, to some of my bolognese type dishes and the kids haven't noticed. Last night I made a 'savoury' mince and flavoured it with Curry powder. My fussy children would never eat something if I told them it was curry, my daughter in particular would be suspicious and resistant. When she asked last night what the yellow stuff on her plate coming from the meat was I told her it was the 'savoury' seasoning. I like the sound of your onion gravy and with give 'savoury' sausages a try sometime too I think. Thanks Rhonda. Tammy, I tried that with Jamie too because I thought Sunny was giving him chilli. Well, he took one bite and put his hand in his mouth! LOL When I asked Sunny, she said she hadn't tried chilli in his food yet. Oops. I'll try again. It's a good strategy. You'll have your mob eating curries before they know it. Literally. Because we are pescetarians I use a soy sausage from Tofurky that is very tasty and an excellent substitute for any recipe calling for sausage. One of our favorite quick meals is making it with scrambled eggs and onions and wrap it in a tortilla for a filling breakfast or dinner. I doubt the old curried sausage would ever lose its appeal. ;- ) Dillpickle, I love the little striped cardy on your bio pic. Is that a ravelry pattern? 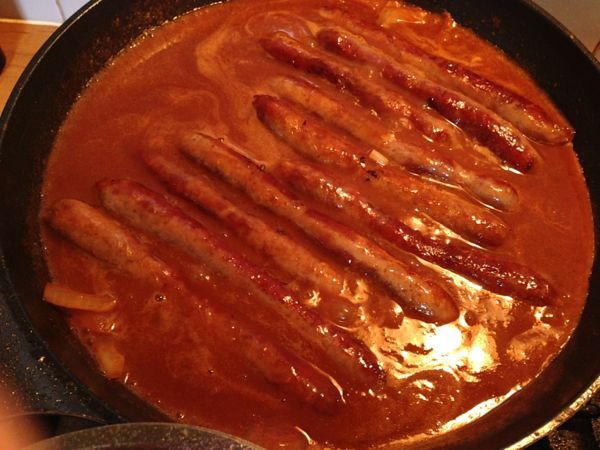 Curried sausages are always a hit here. 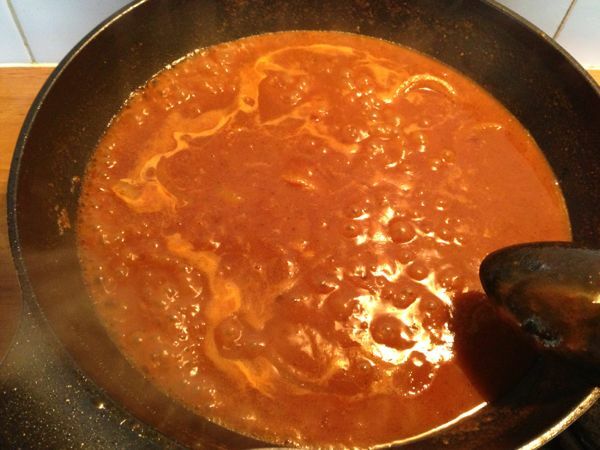 Must try the onion gravy recipe. I love recipes where I know I don't have to go to the shops, but can just use what I have on hand. The simplest meals are often the best, aren't they? 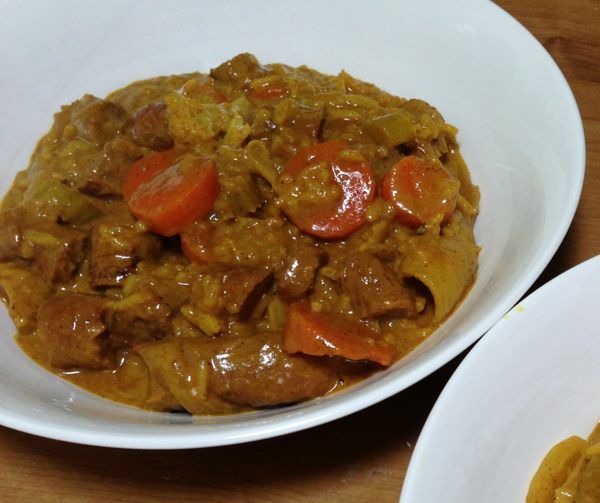 I have to say these are two of my favourite meals, my kids still love curried sausages, not so much the onion gravy though. Shepards pie is a close second, I could go on, savoury mince on toast and ki-see-ming all family favourites. I'll have to try the curried sausages. They sound good! I often fry up apples and onions together to go with sausage. When the girls were little, I would fry them up separately and they only ate the apples but now I mix them up. Just slice and cook in a bit of butter until soft, then sprinkle with a bit of brown sugar. Just had first course for dinner tonight, leftovers in fridge for tomorrow night. Family loved it. thanks a million. Is also really yummy with some feta stirred through and spinach leaves added in the last few minutes of cooking.